The Varicella zoster virus lies dormant in the body after causing chicken pox. In later years, seniors with weakened immune systems may experience another outbreak in the form of shingles. Along with taking prescription medications, at-home remedies help lessen the severity of the symptoms. Here are a few that Oshkosh caregivers can use to relieve their loved one’s discomfort. In addition to drying out the blistered lesions, Caladryl lotion contains antihistamine. The common anti-allergy substance relieves some of the itching associated with the infection. Tea tree oil is another option that acts as a natural antimicrobial agent. Relaxing in the cool water of a bathtub decreases skin temperature and offers some relief from the irritating effects of shingles. After the bath, promptly dry the skin. However, remember to keep towels separate. Wash your loved one’s used towels, clothing and bed linens in hot water to prevent cross-contamination. If the outbreak is limited, live-in Oshkosh, WI, caregivers can apply cool, wet towels to the area. Simply wet one or more towels with cool water, wring out the excess moisture and apply directly to the affected areas on your loved one’s skin. Moisten and reapply the towels as needed. Resist the urge to use ice water as this could irritate the skin further. 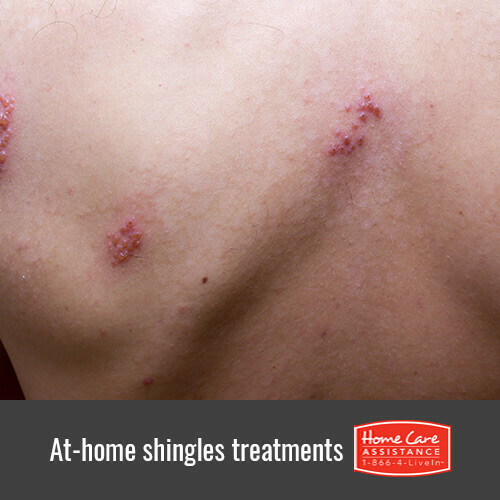 When shingles erupts, the rash generally develops along neural pathways on the torso. The constant pain signals transmitted by the affected nerves can become excruciating. Under the guidance of a physician, you can give your senior loved one OTC or prescription-strength pain relief medications to minimize the discomfort caused by the painful rash. During an outbreak, some common vitamin supplements have been shown to reduce the duration of the infection. The amino acid L-lysine and vitamin C inhibit the virus from replicating. The recommended dosage for lysine supplements is 1,500 to 3,000 milligrams per day. Vitamin B-12 is another useful vitamin because it protects sensitive nerve tissue. Recommended doses of the vitamin are 1,000 to 2,000 micrograms per day. Check with a doctor to see if this option is beneficial for your loved one. It may also help to hire a reliable Oshkosh elderly care agency like Home Care Assistance to look after your loved one. In addition to helping seniors recover from illnesses like shingles, we provide comprehensive live-in and hourly home care to assist seniors with every aspect of daily life including bathing, grooming, cooking, and cleaning. Speak with a friendly Care Manager today by calling 920-710-CARE (2273). Don’t forget to schedule a no-obligation consultation when you call.